Non-government organisations Dustho Sastya Kendra (DSK) and Oxam Bangladesh jointly arranged a workshop on Wednesday for destitute women of ‘Kamrangirchar’ area under Dhaka South City Corporation (DSCC). 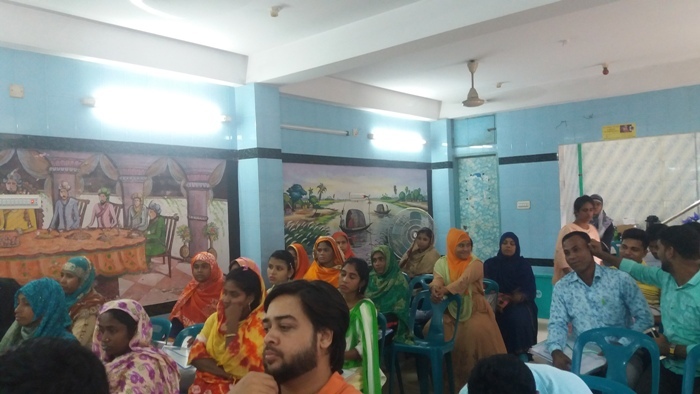 The workshop styled “Network Meeting for Engaging Women with Multi-Sector” was held at a community centre of Kamrangirchar under a project “Empowering Women and Building Sustainable Livelihood in Urban Bangladesh. A documentary on ‘Empowering women and building sustainable livelihood in Urban’ was screened for the trainees presented by DSK’s project manager Tahmina Kabir, at the event. This documentary depicted how the project is running and learning the destitute women of urban’s slum about sustainable living and thinking of upcoming crisis in future’. ‘Around 5500 women of Gazipur and Dhaka city have already been engaged with this project and getting benefit in both direct and indirect ways’, the presentation said. Another councilor Hazi Nure Alam expressed his willingness to help those destitute women with all means. Certificates were handed over to 15 women at the last stage of the workshop. With a view to empowering destitute women through sustainable livelihood, DSK took this initiative since 2017 sponsored by Louise foundation that will end in 2019.